Sooz came over today as planned to do dinner and hang out for my upcoming birthday, and she brought me a present and even cards! (The greeting kind.) I also got 2 giant bottle of Wawa Diet Lemonade Tea, which is my favorite. I could sit here and list at least a hundred reasons why Sooz is my best friend. 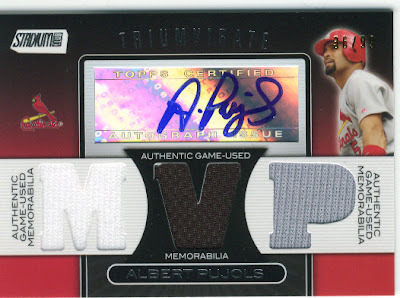 But, I am going to use just two words that say it all: Albert Pujols. The card also came in a clever Chinese food type box, which made me smile because I like steamed Chinese food very much. This was the best birthday present anyone has ever given me. I thought I had a great blog all set up for today, but once I saw Sooz that blog will be for tomorrow because this trumps all. I have been smiling from ear to ear. I absolutely love this card. I have it propped up in front of my screen just to look at when I want. Definitely my favorite card out of every one in my collection.